You know those times when you’re in a hurry or you have no idea what to wear? Yeah, I know, I definitely do. When I’m faced with such dilemmas, I always go back to my basics because they’re the easiest to style and the most comfortable to wear. 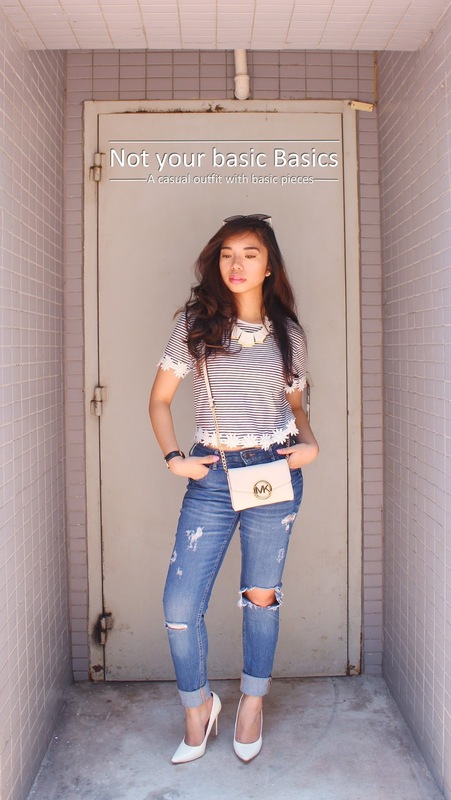 My basic pieces are always denim, be it shorts or jeans with a striped shirt. I own a copious amount of identical striped shirts, it’s not even funny. In this outfit, I’ve got on ripped jeans that have become my favorite jeans to wear even in the summer. Its rips allow for more ventilation so it’s not too hot to wear in the summer. I cuffed and paired it with a striped shirt trimmed with flowers. I love the extra little details with the flower trim and the rips on my jeans because it just makes my outfit a little more interesting than just the standard jeans and striped shirt. I topped it off with pointy white heels for its elegance and cat-eye glasses for its fierce sass. Because meow. So, next time you’re in a pinch, try and base your outfit with basic pieces. You can never go wrong from there. Because you know what they say: When in doubt, go back to the basics. Wait, do they actually say that? Distressed denim has been a part of my new basics lately! They're really the perfect thing to throw on with any t-shirt to run out the door when you're in a hurry. I love yours! 🙂 You look so cute! Thank you for your comments, really appreciate it. Thank you, Carla:D Always my pleasure! This is such a cool look!! Denim is always a no-fail addition to any outfit. You look so classy as always! What a great outfit! Ir really love your jeans! I feel yah girl when you don't know what to wear. I opt to put white tee, jeans and sneaks. This looks so cool and chic. Love you styled your hair! And totally agreed about basics! I love your jeans! I've yet to find one that has a nice hole in the knee, because I'm the pickiest when it comes to the fit of jeans. 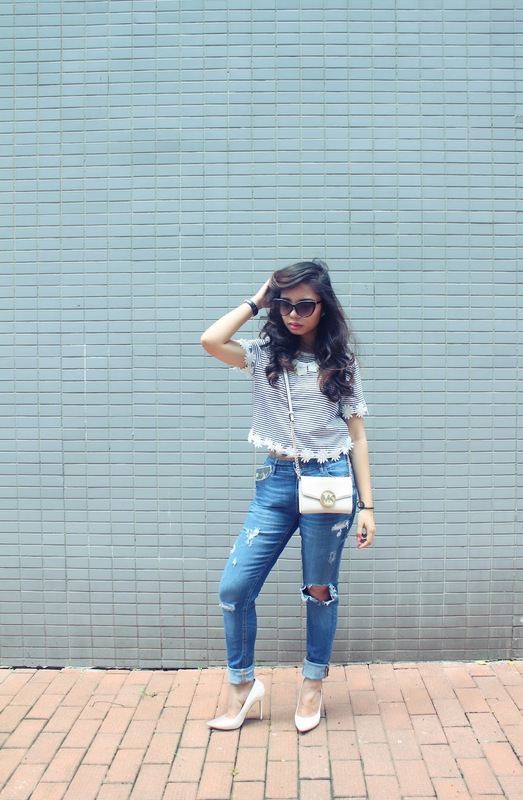 Pairing your basic shirt and jeans with heels makes the look so put together! goddess hair level! im always wearing basic pieces lang actually i like to think its my style but if im being honest to myself its prolly bec im too lazy lang to be adventurous with clothing hehe. ooh, a white tee is always a good idea! I am so picky as well especially with my bottoms but this pair of jeans, I LOVE!